When her son’s stroller had to be discarded due to rough handling during air travel Anne Morkmo got her business idea for a robust and universal stroller bag. Only in Norway about 10,000 strollers were damaged annually and Scandinavian Airlines alone spent 7mNOK on compensations (2007). 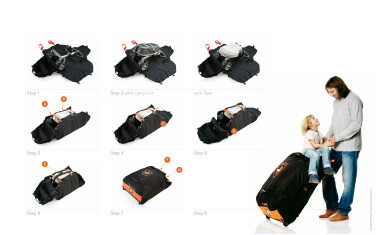 With no such products available in the market Anne recognized the commercial opportunity for Prampack. EGGS Design got involved at an early stage of the design process. We visualized the concept so that the entrepreneur Anne Morkmo could present it for key stakeholders such as Norwegian Air Shuttle, luggage handlers, children’s equipment stores and parents. Based on comprehensive research we gained user-insight and criteria were set for the ideal sturdy stroller bag. We succeeded to fulfil the airliners criteria for hard luggage, the only luggage type where travellers would be reimbursed for damages, while still having a bag that could be rolled up when not in use. Luggage handlers required a bag without loose straps, and handles and wheels for ergonomically correct lifting and transport. A gender neutral and user-friendly bag in an appealing design pleases the parents, the primary users of the bag. It was crucial to ensure store staffs motivation and belief in the product, to ensure successful distribution and sales. In addition EGGS Design contributed with our knowledge on materials and fabrics, ensuring that the criteria for robustness and durability were met. PramPack was an instant commercial success reaching an amazing distribution in over 500 stores in the Nordic countries within two years on the market. 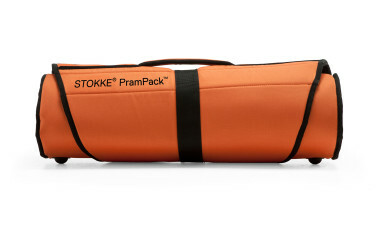 After only two years, at the end of 2010, Prampack was acquired by Stokke, a leading manufacturer of children’s accessories, strollers and furniture.